What if you had at your fingertips… 24 hours a day, 7 days a week… the power to take control of your own health, to reduce frustration, to even improve the quality of your life? What if you had an easy-to-use tool that guided you towards balancing your physical, mental, and spiritual well-being … while removing the stressors in your life that are linked to the six leading causes of death? And an overall sense of well-being you probably never imagined was possible! That’s exactly what my online interactive program The 7 Keys to Eliminating Stress™ is designed to do. You get access to the most current information regarding effective time management, nutrition, exercise, sleep improvement, emotional intelligence, depression, anxiety, and many more stress-related topics. The fact is… stress is undeniably the leading cause behind the rising health care costs you hear so much about today! The good news is… you won’t be paying a lot of money to start eliminating the stress in your life… and enjoying the health benefits that result. For only $29, you can download The 7 Keys To Eliminate Stress™ – to use at home and/or at work… 24 hours a day, 7 days a week. Starting right now! If you purchase today, the total cost for The 7 Keys To Eliminate Stress ™ is just $14.95! • Employers, Health Care Providers, and Health Insurers: Ask about our licensing program and multiple-program discounts. Learn how to actually eliminate stress, not just manage it. Learn to use the 7 most effective strategies of the past 70 years for eliminating stress. Identify your top stressors in 9 key lifestyle areas from among today’s top 100 stressors. Learn how to deal with your own and others’ emotions, especially anger, fear, grief, anxiety, and depression. Upgrade and customize your time management system. Discover which relaxation method(s) work best for you. Learn the importance of good nutrition in relation to stress and what to do about it. Identify the best form(s) of enjoyable exercise for you. Learn how to improve the quality of your sleep. Learn how to apply the six keys to inner happiness. Identify the most effective forms of support for you and where to get it. Learn the importance of pleasure, play and laughter in reducing stress. Learn how to develop and when to use positive self-talk skills. Have access to this program from work and/or home. 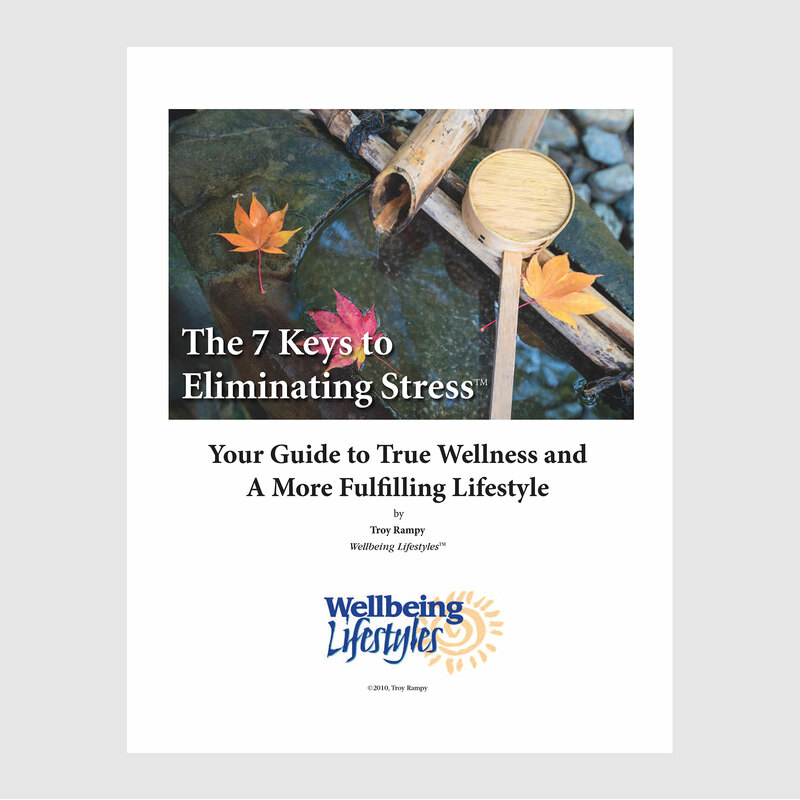 Q: How many pages are there in the eBook The 7 Keys To Eliminating Stress™? A: There are 92 pages. Q: How do I know that these are really the 7 best strategies for reducing stress? A: We spent one year doing the research for The 7 Keys To Eliminating Stress™. We went through 70 years of research since Dr. Hans Selye first coined the term “stress” in relation to humans during the 1930s and we continually found that these 7 strategies have proven their efficacy again and again in being able to not just manage but actually eliminate stress. If you or anyone else did similar research you would arrive at the same 7 strategies. Q: Using the information in this eBook, how quickly will I be able to make the necessary changes in my life to effectively reduce stress? A: There are some things that you’ll be able to change right away, others will take more time. How quickly you proceed and at what level is really up to you. Remember that true change takes place over time. But remember, you’ll be able to access this download any time you want. So you can come back to it again and again for more information, more inspiration, and more motivation. Q: You refer to this eBook as, Your Guide To True Wellness & A More Fulfilling Lifestyle? What exactly does that mean? A: The three main components of any well-designed wellness program are: stress reduction, improved nutrition and effective exercise. All three components are in this program, as well as a whole section specifically on ways to rejuvenate your mind, body and spirit. Q: You provide information on anxiety and depression. Aren’t those clinical issues that should be addressed by health care professionals? A: The 4th strategy deals with emotions and includes a lot of information about anger, fear and grief, as well as anxiety and depression. Our information is derived from several sources including Daniel Goleman’s influential work with “emotional intelligence” and many other sources including some of the best and most current clinical research. While this program is NOT intended as a substitute for working with your primary health care provider, it can be an excellent source of helpful information. © 2003 - 2018 Wellbeing Lifestyles. All Rights Reserved.